In last week’s post, we discussed the rapid development of the hydraulic fracturing (“fracking”) industry in the United States, and some of the innate risks presented by those operations. In particular, the post focused on a recent study that has found a causal link between wastewater disposal/injection, a by-product of fracking, and earthquakes occurring around high-fracking areas in the United States. Initially, it was speculated that earthquakes were caused by fracking itself, a process whereby millions of gallons of water, sand and chemicals are injected underground to break apart rocks to release gas. However, it has now been proven that most of these earthquakes are caused by the underground injection of disposal water (see original post for more detail). The popularity of fracking as an extraction method has extended beyond the United States, and has been readily adopted in countries like Canada, Argentina and Australia with huge shale oil and gas potential. In Canada, the provinces of British Columbia, Alberta and Saskatchewan have the highest concentrations of (fracking) wells. A group of scientists from the University of Calgary has recently released a study evaluating whether there is a causal connection between fracking in western Canada, and an increase in seismic activity around the well-sites. The study revealed that unlike the United States, where earthquakes are induced by the subsoil disposal of wastewater, a series of earthquakes in Alberta within the last five years has been attributed to fracking, or hydraulic fracturing, in which water, chemicals and sand are injected at high pressure into a well drilled in a shale formation to break up the rock and release oil and gas. According to the study, the quakes were induced in two ways: by increases in pressure as the fracking occurred, and, for a time after the process was completed, by pressure changes brought on by the lingering presence of fracking fluid. To the east in the fault zone, the earthquakes occurred during the fracking process itself, which continued for up to a month after the fracking process was completed. To the west, most earthquakes occurred intermittently over several months after the fracking ended. While Alberta and other affected areas do not have the infrastructural density that Oklahoma has, several major pipelines and operations are found within the proximity of Fox Creek, where these earthquakes have been occurring. Last week we discussed earthquake coverage and how it may respond to losses caused by human-induced earthquakes. Another, often-forgotten, coverage that may become relevant in the next few years as the risk of earthquakes increases in these areas is Civil Authority coverage. Civil authority provisions are usually written as additional coverage provisions, not exclusions, and provide coverage for lost business income due to an action taken by a civil authority. So, how do civil authority clauses and earthquakes interact? Generally, civil authority claims arise out of the loss of business income due to mandatory curfews, evacuations, or restrictions of access (e.g. Hurricane Katrina, 9/11, etc.). 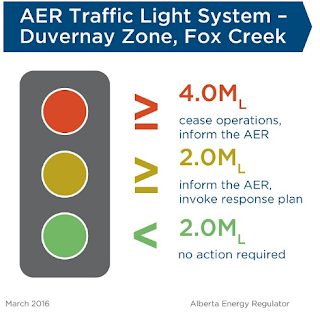 Following the occurrence of a MW 3.9 earthquake on 23 January 2015, the Alberta Energy Regulator, introduced new regulations for the notifications and monitoring of earthquakes around well areas. 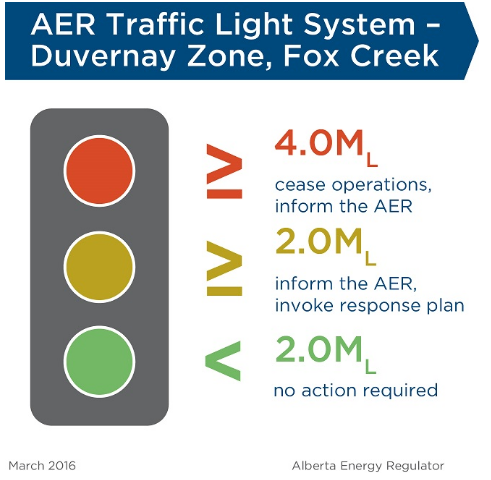 Included among them, was the implementation of a “traffic light protocol” that requires the immediate shutdown of hydraulic fracturing operations following an earthquake of local magnitude 4.0 or greater within 5km of an affected well. While these shutdowns tend to be temporary, an increase in occurrences or severity may result in a long period of operational shutdown. Failure to comply with these procedures may result in an enforcement action which could include the prolonged shutdown of operations. Other jurisdictions have implemented similar protocols, and some U S. states, and countries have banned this type of operation altogether. While it is hard to predict the likelihood of a catastrophic event resulting from a fracking-induced earthquake, several of the areas affected by this peril are pipeline and oil/gas hubs. A large enough earthquake or series of earthquakes could result in a prolonged shutdown of operations by order of the relevant regulatory body, thus causing severe business interruption losses to well and pipeline operators. Traditional civil authority provisions read: we will pay for the actual loss of Business Income you sustain and necessary Extra Expense caused by action of civil authority that prohibits access to the described premises due to direct physical loss of or damage to property, other than at the described premises, caused by or resulting from any Covered Cause of Loss. Most often, these clauses are also subject to the BI waiting period, and only offer coverage for limited periods of time. For coverage under Civil Authority provisions, an insured is usually required to demonstrate that the physical damage to its property is the result of a peril covered under the policy. And, as discussed in our last post, insureds will first have to demonstrate that earthquake is a covered peril under the policy, and the denial of access or “action” must be the proximate cause of a loss of business income. As the risk of fracking-induced earthquakes increases, regulatory authorities may take a harder stance against widespread fracking in the future. In the short-term, a significant enough earthquake may result in the interruption of operations of wells and pipelines surrounding the quake-affected areas. While most of the coverage issues will have to be sorted out on a case-by-case basis, insurers should be aware of this new, or at least unconventional, risk that may affect their insureds’ business operations.